An error-strewn game saw the scores level on penalties til the final quarter of the game, and with Nick Evans showing his human side, missing two penalties during the game, Quins were left playing catch up. 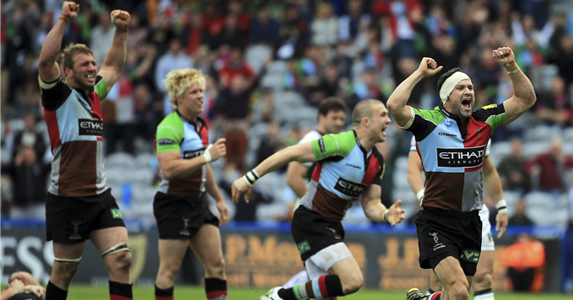 Lee Dickson’s try extended the Saints’ lead to make it 15-23, but a Joe Marler try in the dying minutes broke the heart of Saints fans to see Quins make their first ever Premiership final. Joe Marler was the man who touched the ball down, but he was assisted by every member of his team who formed a 15-man maul to push him over the line. 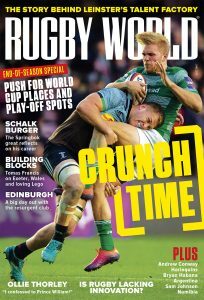 Quins Director of Rugby Conor O’Shea admitted that it was a nervous moment watching the backs, who ‘don’t know what they’re doing’ in such situations, get involved in the unplanned move, but the team’s instinct paid off. 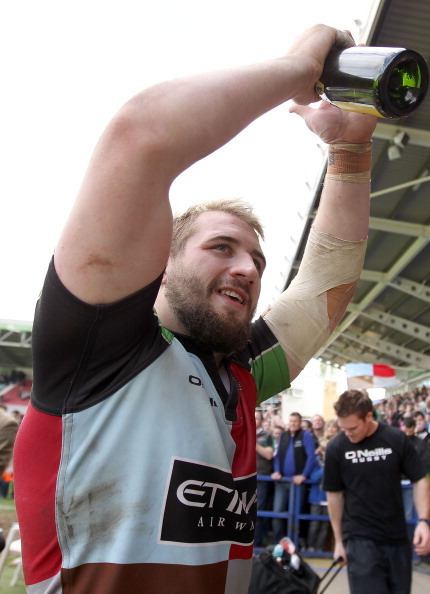 The Harlequins front row are aged just 21 (Marler), 23 (Gray) and 26 (Johnston), but the young trio dominated Tonga’uiha, Long and Mujati today, showing that the London club’s scrum is a force to be reckoned with. It’s good news for England coach Stuart Lancaster, who has just recruited Marler and Gray to tour South Africa in June. Quins made a numer of errors today, and O’Shea insisted it was the occasion that got to the team, but this young team will need to settle down quickly in the final if they hope to lift the trophy. 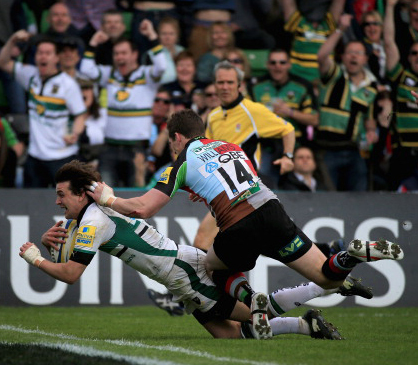 Ben Foden made his 100th appearance for the Saints in the game against Harlequins, but Mallinder admitted that the loss of a number of their England players had disrupted their season. They have been without Chris Ashton, Dylan Hartley, Courtney Lawes, Calum Clark and Tom Wood over the course of the season. HARLEQUINS: Mike Brown; Tom Williams, George Lowe, Jordan Turner-Hall, Sam Smith (Matt Hopper 69); Nick Evans, Karl Dickson; Joe Marler, Joe Gray, James Johnston, Olly Kohn, George Robson, Maurie Fa’asavalu (Tom Guest 63), Chris Robshaw (capt), Nick Easter. Not used: Rob Buchanan, Mark Lambert, Will Collier, Tomas Vallejos, Richard Bolt, Rory Clegg. Try: Marler. Con: Evans. Pens: Evans (6). NORTHAMPTON: Ben Foden; Chris Ashton, George Pisi, James Downey (Tom May 75), Paul Diggin; Ryan Lamb, Lee Dickson (capt); Soane Tonga’uiha (Alex Waller 67), Andy Long (Ross McMillan 61), Brian Mujati (Paul Doran-Jones 57), Mark Sorenson, Christian Day, James Craig (Teimana Harrison 63), Phil Dowson, Roger Wilson (Ben Nutley 75). Not used: Martin Roberts, Stephen Myler. Try: Dickson. Pens: Lamb (6). Sin-bin: Wilson.